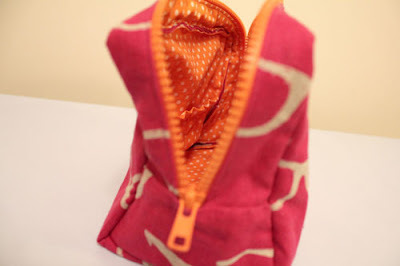 Needing something to put my deodorants in when I give them as gifts, I turned to the Weekend Away Travel Bag from Heather Ross's Weekend Sewing. 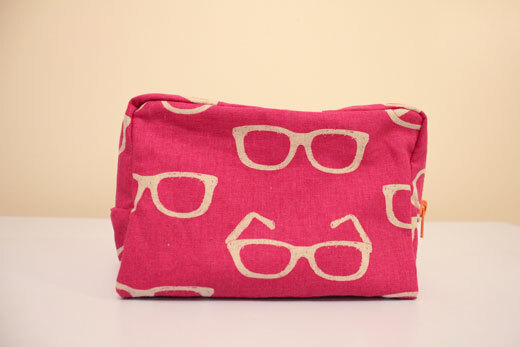 The bag was fairly easy to make, and pretty enjoyable except for the final stage of sewing it together. Just about killed my little machine. I had plans of lining future versions with laminated cotton for wipe-ability... I don't think so. 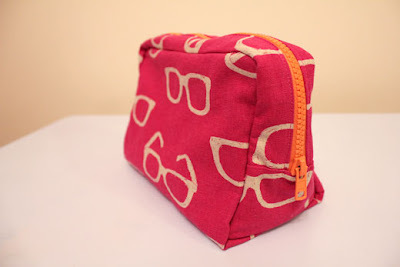 The upholstery weight Echino Ni-Co cotton exterior (in Magenta Sunglasses) and a basic quilting cotton lining is about all I think my machine can handle when it comes to rounded corners and 1/4-inch seams through that many layers of fabric. Hand stitching around the zipper when finishing the ends was not the most fun, but it looks nice in the end. As other reviewers pointed out, Heather forgets to mention in the book that one-way fabrics won't work, because the print is upside down on one side of the bag. I knew this going in, but decided to use the sunglasses fabric anyway because I had some left over from a tote project from last spring, and thought it might look neat with the chunky orange zipper. This bag is going to my dear friend Christina, mother of Louisa's best pal Dorothy. Christina's birthday is this weekend, and tomorrow their whole crew is joining us for some hot buttered rum before the Crozet Christmas Parade. Yum! I'll definitely try making this bag again, and hopefully will have better luck with those corners.